Is KDP Select Salvation or Damnation for Indie Authors? Ultimately, whether KDP Select works for you depends on the strength of your sales across various platforms. It’s funny how whenever I discuss the KDP Select Program — the Kindle Direct Publishing Select Program from Amazon.com — I feel as though I must either carry a pitchfork or a harp. The program is either the salvation of indie authors, or its damnation. The KDP Select Program is neither. It is a marketing opportunity that may or may not work for you. Utilizing KDP Select’s tools has worked for me. I leapt into five-figure monthly royalties and was announced as one of the top ten authors in the Kindle Owners’ Lending Library for the month of December. I could sing the praises of the program all day long, but it would not help you decide if the program was right for you. In this article, I hope to demystify KDP Select and give you actionable advice on how to evaluate if the program is a good match for your marketing efforts (whether you’re just entering the program or renewing in ninety days). Quickly, let’s review the major “pros” and the “con” to the KDP Select program. You are allowed into the Lending Library, where the current value of a lend is $1.70. Each lend counts as a “unit sold” and helps your paid sales rankings. You are allowed to control five “free” promotional days. You must commit to exclusivity with Amazon for 90 days. Notice how I didn’t say “commit to Amazon for your entire lifetime,” but commit to them for only three months. In the scope of your book’s longevity, that is a blink of an eye. Now, it may be an important blink, but a blink it is. I know that many people have had an exceptionally sharp knee-jerk reaction to this exclusivity clause, but hopefully, after this article, you will understand how to interpret that clause as it relates to you directly, so that you can make the most informed decision possible. The exclusivity clause does mean that you must remove your e-book from all other retailers and give up royalties from B&N, Smashwords, Kobo, your own website, etc. This is the first factor that we consider when deciding if KDP Select is a match for your title(s). As a general rule of thumb, if, on the books you are thinking of enrolling, you are making 95% or more of your royalties from Amazon, then the decision to go exclusively with them in order to enter the Kindle Owners’ Lending Library and have control over free promotions is a pretty easy one. There is very little downside in losing 5% of your monthly income on these books to gain these exceptional tools. Therefore, most authors in this 95% Amazon royalties bracket can jump into the KDP Select program with both feet. You are risking so little by leaving the other sales platforms and potentially gaining so much with KDP Select, that the decision is simple. Conversely, if your KDP Select-enrolled book is earning more than 30% of its monthly royalties from non-Amazon sources, the decision is pretty easy. Because, on average, by joining KDP Select, you can earn an additional 26% in royalties from the KDP Select fund, on top of royalties from your paid sales (see the Amazon KDP Select Press Release for details on that figure). Sure, you could outperform this 26% average bump, but you would be gambling on having greater than a 30% return on your exclusivity investment for these books. And what if you happen to underperform and only increase your sales by, say, 15%? How many royalties would you have lost from those non-Amazon platforms? You also must consider that in leaving those other platforms you are also giving up your current sales rankings. This is that important “blink” that I spoke of. A “blink” of three months off of those other platforms could have catastrophic consequences to your overall royalties, since it can be very difficult, if not nearly impossible, to scale those bestselling lists again and reclaim your previous royalties from non-Amazon sources. For these reasons, it makes very little sense for authors who have a significant royalty stream in excess of 30% from non-Amazon platforms to give up those royalties in the hope that they will overperform the average KDP Select revenue bump. Therefore, those authors who earn 6–29% of their royalties from non-Amazon sources must really drill deep to see if KDP Select is for them. How do those authors decide if KDP Select is a worthwhile risk? The answer to this question is a bit more complicated. Let’s take the decision-making process step-by-step. Start with this question: how well are you selling? The more you are selling, the more likely you are to be on best-selling lists at Amazon, which greatly increases your discoverability and usually translates into higher lends and “free” giveaways (and therefore greater post-“free” sales). On the other hand, you also might be well positioned on your non-Amazon platforms. Which weighs more heavily? Being well ranked on Amazon or non-Amazon platforms? The answer is in sheer sales volume. Amazon has the lion’s share of the market. Therefore your ranking on Amazon is weighted much more heavily than any other platform. You simply have a far greater chance of selling far more books on Amazon. But let’s drill deeper than even that. If you are in this mid-bandwidth of non-Amazon royalties (6–29%), you will need to calculate your exact royalties over the last three months from all other sales platforms combined. Hang onto this figure. Calculate your last three months’ Amazon royalties. Then calculate a potential 26% bump in Amazon royalties for the book you would like to enroll in the KDP Select program (by gaining royalties from “lends” in the Kindle Owners’ Lending Library). Now, let’s turn our attention to your rankings. If you are already on a Top 100 Bestselling list in a genre, what would a 26% increase get you? Meaning, would that 26% increase propel you into the Top 80? 60? 40? 20? 10? On average, increasing your best-selling ranking by each page will increase your royalties by about 7%. You sit at ranking #85 in your genre. By using all the tools that KDP Select provides for you, your book should get you a bump into the high 70s. That gets you onto the #60-80 rankings, which should give you about a 7% bump in royalties. Now, add together your potential 26% bump from the KDP Select Fund along with your 7% bump from moving up the best-selling lists (if you are at the cusp of moving up to another page). How does that compare to the money you would lose from your other sales platforms by going exclusively with Amazon? You then can decide if the leap to KDP Select is worth it. One other factor to consider: As other authors enter the KDP Select program and begin using its powerful tools, they may begin to outsell you, forcing your best-selling rankings down, and therefore negatively impacting your Amazon royalties. Remember, if you fall off by a page — going from 79 to 85 — it will decrease your royalties by about 7%). Lastly, let’s consider the author who is deriving 6–29% of their royalties from non-Amazon sales platforms, yet isn’t selling well (ranked worse than 50,000). How do they determine if KDP Select is for them? Of most importance, the one factor that is not in play is losing your sales rankings on the other e-book platforms. More than likely, if you are ranked 50,000+, you are not on any significant bestselling lists, so therefore, you will not feel the sting of leaving that platform and returning far lower. With that concern out of the way, the decision really is 50-50. Basically, if you sell well, you will lend well, and you will “give away” well. If you aren’t selling well, you won’t lend well, or even “give away” well. But what are you giving up to take the chance that your book is one of those “breakout books” that beats the odds? There is no guarantee with this strategy, but if your sales on the other e-book platforms have been stale, then taking a three-month gamble on KDP Select might be an interesting experiment. Hopefully, this article has helped to clear up many of the misconceptions and superstitions surrounding the KDP Select program and has given you some metrics to logically evaluate whether KDP Select is for you! 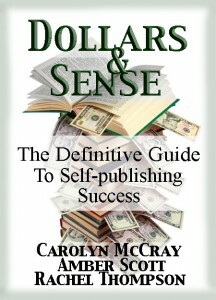 Carolyn McCray is a social media and sales consultant to writers and publishing houses alike. Her non-fiction book, “Dollars & Sense: The Definitive Guide to Self-publishing Success” debuted at #1 on the Amazon Bestselling list for Study & Teaching and reached #2 on the Authorship Bestselling list beating out such rock stars as JA Konrath and Zoe Winters. Carolyn is also the founder of the >Indie Book Collective, an organization dedicated to helping writers utilize social media to sell their books. DISCUSS: Will iBooks 2 Inspire More Authors to Innovate?